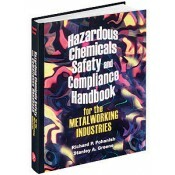 This unique handbook provides operators and technicians in the metalworking, machining, and metal finishing industries with an easy-to-use, single-volume guide to the hazardous materials commonly found in the above sectors. Containing detailed information on nearly 450 chemical hazards, this work provides identifiers (foreign and domestic); trade names and chemical synonyms; physical properties; short- and long-term health effects; guidelines for exposure; respirators; warnings; incompatibilities; fire data; and OSHA, EPA, California, and Canadian safety recommendations and regulations. No other reference offers this kind of integrated compilation of safety and environmental compliance data or directory information related to these industries. You will need no other reference! • Includes an extensive introduction outlining and explaining the requirements and regulations. • Presents each chemical record in a uniform format of data elements, including record number, record name, trade names and chemical synonyms, EEC numbers, CAS number, 2004 Emergency Response Guidebook four-digit ID, DOT Hazard class or Division, three-digit ERG Guide, molecular formula, RTECS number, physical properties, and health and safety information. • Contains extensive appendices including: sources of information, separate lists of dangerous oxidizing materials by name and CAS number, an updated list of all Poison Control Centers in the U.S., glossary of safety and environmental terms, extensive synonym and trade name index, and a complete CAS number index to chemicals covered. • Takes an international approach in that chemical records contain: European Economic Community ID numbers, European Inventory of Existing Commercial Substances ID numbers, Canadian WHMIS ingredients disclosure list levels, International Agency for Research on Cancer information about carcinogens, and MAK values from Deutsche Forschungsgemeinshaft. • Covers important metalworking hazards such as mineral oil mists and welding fumes.